Indefatigable developer, Ed Ghandour, has finally obtained his long-awaited permit to build a massive hotel and condo complex on the rapidly eroding Sand City beach and says he’s hoping to break ground soon. Breaking ground, in this case, means digging an immense (over 700,000 cubic yards of grading) hole in dunes that currently host rare species, like the Monterey spineflower, Smith’s blue butterfly and western snowy plover, then plopping in over a million square feet of human habitat in buildings rising as high as nine stories above the beach. We have no doubt that Ed means what he says about getting started right away. That’s because we understand the Coastal Commission has placed conditions on the project giving notice that seawalls will not be permitted and requiring buildings be torn down as soon as the edge of the bluff gets within ten feet of them. 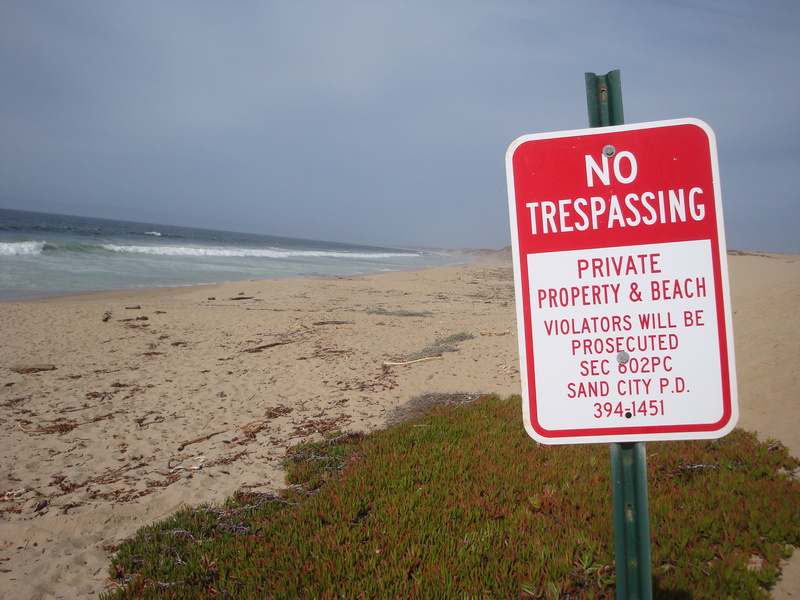 The point is to avoid creating another mess like the Ocean House Condos or the Monterey Beach Hotel, where shoreline armoring is leading to disappearance of the beach. What this means for Mr. Ghandour is that the sooner he gets his project built and sold, the sooner he can stop worrying about a major erosion event scaring off potential buyers. He may be comforted by the fact that homes in dangerous areas rarely seem to pay much penalty in terms of property value. People are more than happy to ignore obvious signs of impending doom and flock to pay top dollar for properties in extreme fire hazard areas, in flood zones, and on unstable slopes. But will people actually buy condos when they know that at some point in the not necessarily distant future they will have to be torn down and the property given over to the ocean? It’s hard to imagine anyone being foolish enough to provide insurance against a risk of this magnitude, but will the owners perhaps be eligible for some kind of government insurance and, thus, shift the burden of this certain loss onto the taxpayers? We wonder. It isn’t often that people build anything, let alone a several hundred million dollar project, on a shoreline capable of moving inland by as much as 40 or 50 feet in a single storm. It will also be interesting to see, now that Mr. Ghandour has obtained his permit, whether he will continue to call his development an “Eco Resort.” Will wealthy eco-tourists really be attracted to such a development, or will a new name reveal the true target demographic? Ed should be aware that the only true signifier of class on the Monterey Peninsula is the word “at.” There’s the Lodge at Pebble Beach (formerly the Pebble Beach Lodge), The Inn at Spanish Bay, the proposed The Collection at Monterey Bay (collection of what? Kelp Flies? ), and so on. Maybe Le Chateau d’ Gran Hubris at the Del Monte Avenue Freeway Offramp? This entry was posted on Thursday, May 1st, 2014 at 12:26 pm and is filed under Coastal Development/Erosion, Politics. You can follow any responses to this entry through the RSS 2.0 feed. You can leave a response, or trackback from your own site. 2 Responses to The Monterey Bay Shores “Eco Resort:” How Long Will it Last? Once again it appears that the permit process is all about the money and NOT the environment.